Results for the most recent invitation round on 25 May 2016 have been published. 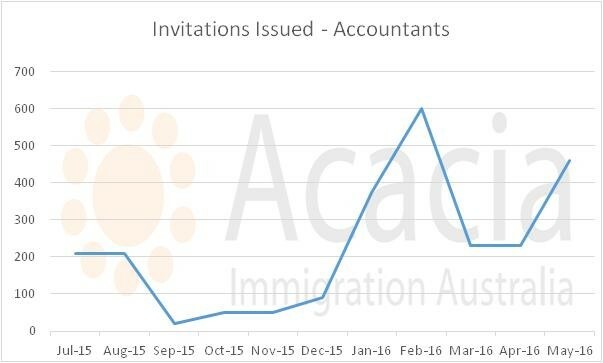 A higher number of invitations were issued for accountants and IT professionals than expected, and a number of occupational ceilings were filled in May. 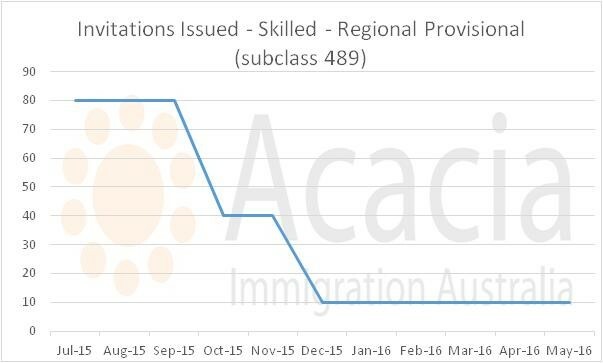 As a result, no further invitations will be issued in these occupations for Skilled Independent Subclass 189 visas or Family Sponsored 489 visas until 1 July 2016. Note that none of these have been removed from the Skilled Occupations List, so they will be available from 1 July 2016. It is also still possible to apply for state nominated skilled visas for these occupations. 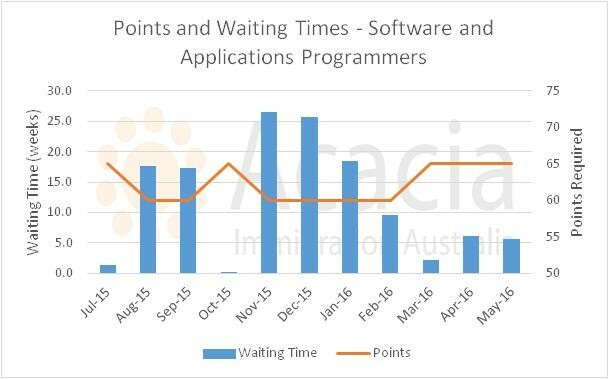 It's possible that these will become pro-rata occupations next program year, this means it is possible that higher point score or longer waiting times may apply to receive an invitation. Once the occupational ceilings are announced in July we will have a better idea. 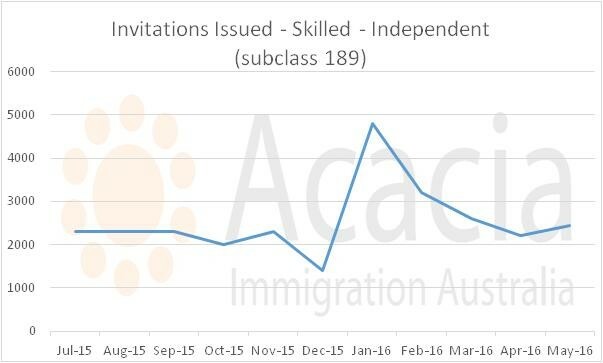 The total number of invitations issued for Skilled Independent Subclass 189 visa in May was 2,435, which is a slight increase from April (2,200). 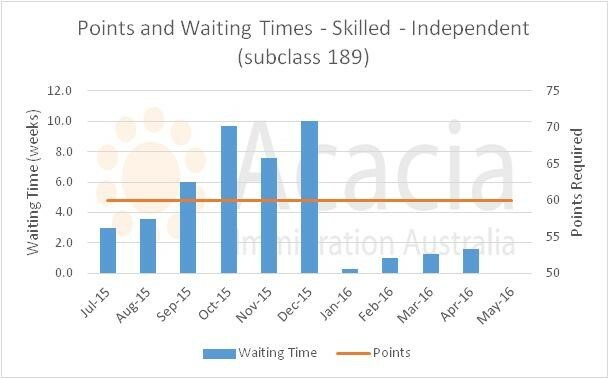 The minimum score required for applicants to receive a 189 invitation for most occupations remains at 60 points and this has been the same all year. Applicants with 60 points would receive an invitation within 2 weeks. 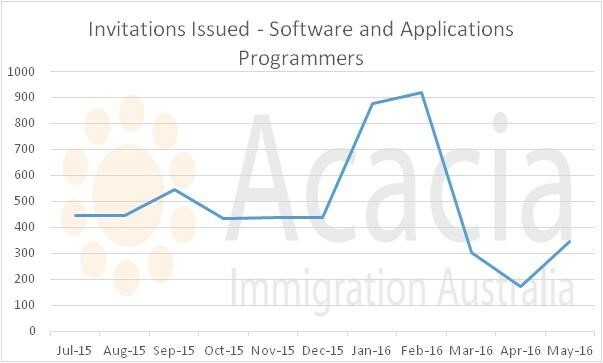 This suggests that Immigration is not receiving enough EOIs from eligible applicants. 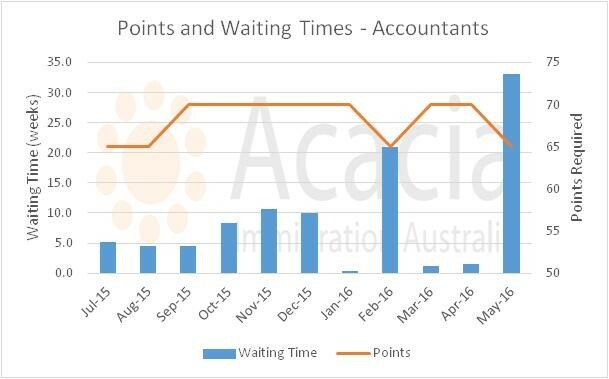 The total invitations issued for Accountant was 460 for May which was double April's number. As a result the occupational ceiling was filled in May rather than June. The minimum score point required to receive an invitation was 65 points down from 70. The waiting time to receive an invitation on 65 points was about 33 weeks. 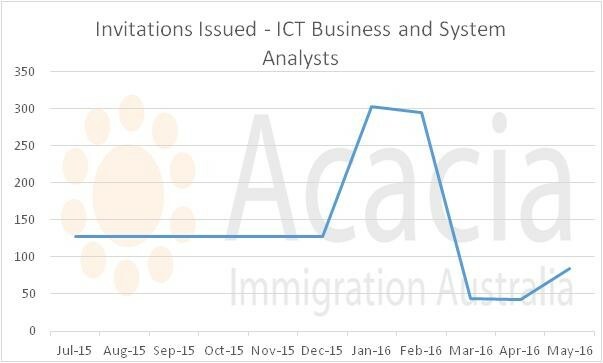 ICT Business and System Analysts also received two months' worth of invitations in one. This resulted in the ceiling being reached one month early as well. The minimum score points required to receive an invitation remained at 70, a level that it had been in since March. It took less than 2 weeks to receive an invitation with 70 points in the 27 May round. Similar to the above occupations, there was an doubling in the invitations issued for this occupation which resulted the ceiling been reached in May instead of June. The minimum points scored required to receive an invitation was 65, with a waiting time of 2-3 invitation rounds. The overall invitation numbers for Family Sponsored 489 have been very low since December 2015, with a total of 10 being issued each month. 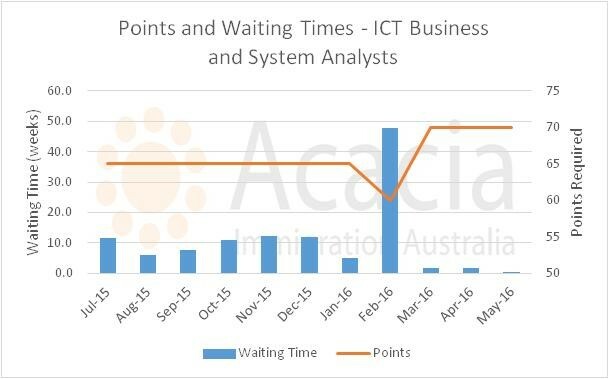 In the 27 May round, the minimum score points required to receive an invitation was 65 points with over 30 weeks waiting time. There have been some interesting trends in the last program year for SkillSelect. Occupational ceiling were reached for more occupations compared to last program year which suggests that General Skilled Migration is more competitive than ever. We are eagerly awaiting for the announcement of the new occupational ceilings in July as this will give us a better idea of what to expect in the next program year (July 2016 to June 2017). 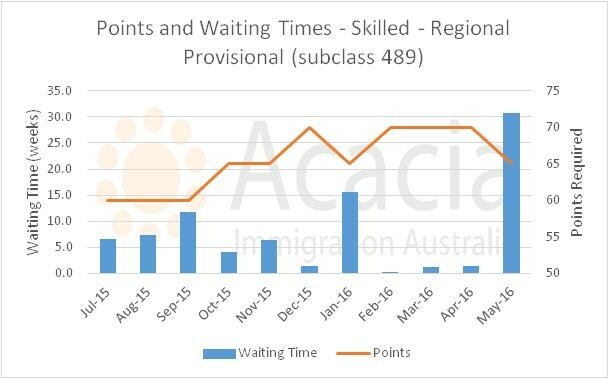 Applicants will need to have a solid strategy to improve their chances of success in applying for skilled migration. For assistance with your migration strategy please book a consultation to speak with one of our experienced migration advisors.